RAND fielded the 2015 HRBS among active-duty U.S. military service members in the Air Force, Army, Marine Corps, Navy, and Coast Guard between November 2015 and April 2016. 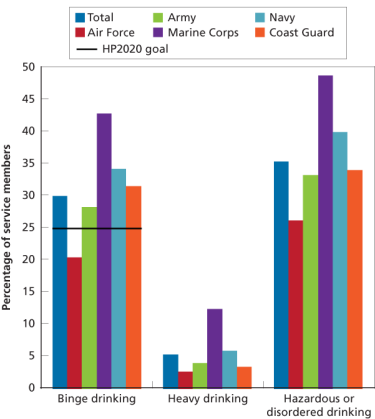 The survey used a random sampling strategy, stratified by service branch, pay grade, and gender (as obtained from Defense Manpower Data Center records). Respondents completed the anonymous survey online, with a response rate of 8.6 percent. This resulted in 16,699 usable surveys (of 201,990 invited to participate). For some analyses, the number of usable surveys may differ because of differences in nonresponse for individual items. To represent the active-duty population, we weighted responses to account for the oversampling of service members in certain strata. In this research brief, we report point estimates and 95-percent confidence intervals (CIs). We tested differences in each outcome across levels of key factors or by subgroups — service branch, pay grade, gender, age group, race/ethnicity, and education level — using a two-stage procedure based on (1) a Rao-Scott chi-square test for overall differences across levels within a single factor and, if the overall test was statistically significant, (2) two-sample t-tests that explore all possible pairwise comparisons between levels of the factors (e.g., junior officers compared with noncommissioned senior officers). Readers interested in these differences should consult the full 2015 HRBS final report. This brief is one of seven, each corresponding to a different chapter in the full report. An eighth brief summarizes the entire report. 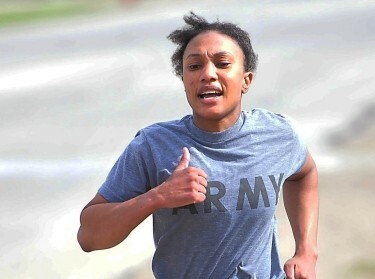 The Health Related Behaviors Survey (HRBS) is the U.S. Department of Defense (DoD)'s flagship survey for understanding the health, health-related behaviors, and well-being of service members. Fielded periodically for more than 30 years, the HRBS includes content areas — such as substance use, mental and physical health, sexual behavior, and postdeployment problems — that may affect force readiness or the ability to meet the demands of military life. The Defense Health Agency asked the RAND Corporation to revise and field the 2015 HRBS. In this brief, we review results for substance use, particularly use of alcohol, tobacco, and illicit and prescription drugs. We note possible limitations to the data and implications of the findings. 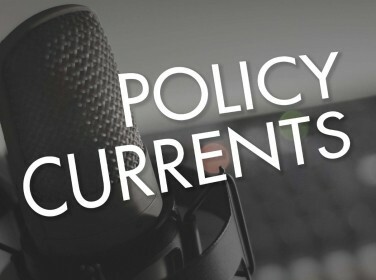 Where possible, we compare our findings to prior HRBS findings and U.S. general population data, including progress toward Healthy People 2020 (HP2020) objectives established by the U.S. Department of Health and Human Services. Because the military differs notably from the general population (e.g., service members are more likely to be young and male), these comparisons are offered only as a benchmark of interest. Excessive alcohol consumption, including binge and heavy drinking, is one of the leading preventable causes of death in the United States. It can lead to risky sexual activity, accidents, violence, and other serious consequences. Alcohol misuse is linked to a variety of adverse outcomes in the military and is a costly problem for DoD. In the 2015 HRBS, 30.0 percent (CI: 28.4–31.5) of service members were binge drinkers compared with 33.1 percent (CI: 32.3–33.9) in 2011. In the most recent comparable U.S. general population estimate, 24.7 percent (CI: 24.1–25.3) of adults were binge drinkers. Some of the disparity between the military and general population is likely due to the high percentage of men and young adults in the armed forces; both groups are more likely to binge drink within the U.S. general population. The HP2020 target for the general population is for no more than 24.4 percent of adults to engage in binge drinking. Across all services, 5.4 percent (CI: 4.6–6.1) of personnel were heavy drinkers. In the U.S. general population in 2014, 6.7 percent (CI: 6.4–7.0) of all adults were. 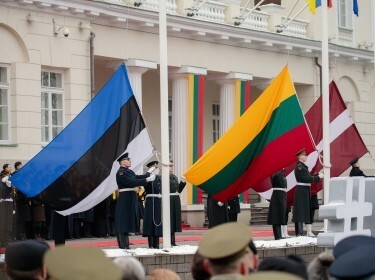 More than one in three (35.3 percent; CI: 33.7–36.9) service personnel met criteria indicative of hazardous drinking or possible alcohol use disorder. Although the 2011 HRBS did not report overall percentages for this measure, the 2008 HRBS did (using the AUDIT, a measure roughly comparable to the AUDIT-C). At that time, the percentage of hazardous drinkers was 33.1 percent (CI: 31.1–35.3). Binge, heavy, and hazardous drinking varied by service and pay grade and were all higher among men than women. All three behaviors were most prevalent in the Marine Corps, where hazardous or disordered drinking occurred among nearly half of service members (Figure 1). The Air Force had the lowest percentage of each of these drinking behaviors. In general, higher percentages of problematic drinkers were found among junior enlisted members, although the percentage of hazardous or disordered drinkers was highest among junior officers. 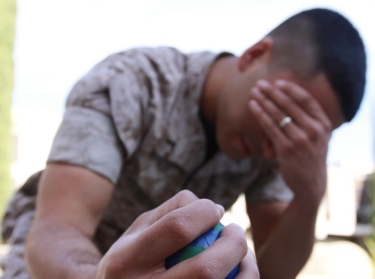 In the 2015 HRBS, 8.2 percent (CI: 7.2–9.1) of service members reported one or more serious consequences from drinking (e.g., "I hit my spouse/significant other after having too much to drink"). In addition, 6.9 percent (CI: 5.9–7.8) reported alcohol-related risk behaviors (e.g., "I drove a car or other vehicle when I had too much to drink"); in 2011, 9.7 percent of HRBS respondents reported such risk behaviors. Across the services, 6.1 percent (CI: 5.3–6.9) of respondents reported work-related productivity loss from alcohol use. More than two-thirds (68.2 percent; CI: 66.8–69.7) of service personnel perceived military culture to be supportive of drinking (e.g., indicated that drinking was "part of being in my unit" or "part of being in the military"). 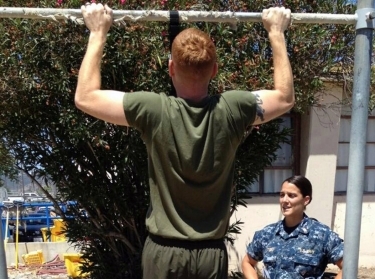 Marine Corps personnel, junior enlisted personnel, and men were the most likely to have this view. Service members were about as likely to report purchasing alcohol on base as off base. Navy and Coast Guard personnel, officers, and women were less likely to report purchasing alcohol on base than off base. Fewer than one in five (18.9 percent; CI: 17.6–20.2) service members felt that their supervisor strongly discourages alcohol use. Army and Coast Guard personnel and women were more likely to view leadership as strongly discouraging alcohol use, and junior officers were less likely to feel this way. Tobacco use is the single-most preventable cause of disease and death in the United States. Exposure to secondhand smoke also poses grave risks, including lung cancer. Cigarette smoking is the most common form of tobacco use. The percentage of current adult smokers in the nation has been declining over the past decade, as has the percentage of daily smokers and the number of cigarettes typically consumed by them. However, smoking rates remain particularly high among men and younger adults — demographic groups that make up much of the U.S. military. Other forms of tobacco use are also of concern. Smokeless tobacco (e.g., chewing tobacco, snuff) is a particular issue in the military. And although the health effects of electronic cigarettes (e-cigarettes) are not yet known, they contain chemicals that may harm users and those with secondhand exposure. Across all services and demographics, 13.9 percent (CI: 12.7–15.2) of service members were current cigarette smokers, and 7.4 percent smoked cigarettes daily. By contrast, the 2011 HRBS found that 24.0 percent (CI: 23.4–24.6) of service members were current cigarette smokers. Among all U.S. adults in 2014, 16.8 percent were current smokers and 12.9 percent were daily smokers. The HP2020 target is to reduce the percentage of adult current cigarette smokers in the general population to 12 percent or less. More than one-third (35.7 percent; CI: 34.1–37.3) of service members had ever tried e-cigarettes, 12.4 percent (CI: 11.2–13.7) were current (past-month) users, and 11.1 percent (CI: 9.0–13.2) were daily users. The 2011 HRBS found that 4.6 percent (CI: 4.2–5.0) of service members had smoked e-cigarettes in the past year. In 2014, 12.6 percent of the general population had ever tried e-cigarettes, and 3.7 percent were current users (used some days or every day). In the 2015 HRBS, 8.7 percent (CI: 7.7–9.6) of service personnel were current (past-month) cigar smokers. In the adult general population, 4.8 percent (CI: 4.6–5.0) were current cigar smokers. The percentage of service members who had ever used smokeless tobacco was 32.7 percent (CI: 31.1–34.3), and the percentage who used currently (in the past month) was 12.7 percent (CI: 11.5–14.0). Among U.S. adults in the general population, current use was 3.4 percent (CI: 3.2–3.6) in 2014. 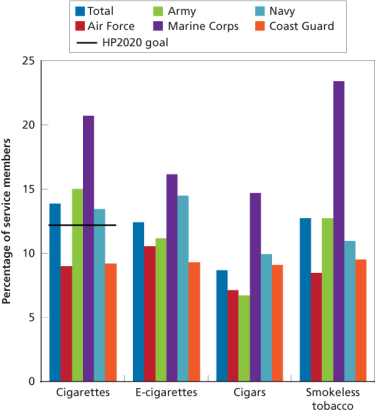 All forms of tobacco use were more common among personnel in the Marine Corps than in any other service branch (Figure 3). Men were more likely than women to engage in all four forms of tobacco use, especially smokeless tobacco, and junior enlisted service members were the most likely to use cigarettes, e-cigarettes, and smokeless tobacco. DoD Instruction 1010.15 establishes a smoke-free indoor workplace for service members. Yet among all nonsmoking service members, 16.9 percent (CI: 15.5–18.3) reported past-week exposure to secondhand smoke at work. In the general population, 20.4 percent (CI: 19.6–21.2) of employed nonsmokers — and 16.4 percent (CI: 15.7–17.2) of employed nonsmokers with an indoor nonsmoking workplace policy — reported past-week exposure to secondhand smoke at work. Most personnel (56.0 percent; CI 51.8–60.1) who reported purchasing cigarettes reported that they did so on base. 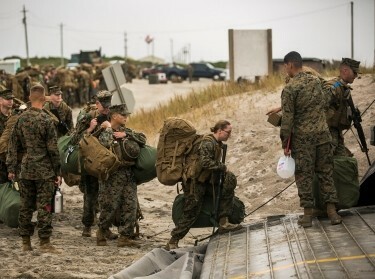 The Marine Corps, the service with the largest percentage of current cigarette smokers, had the largest percentage of smokers who bought cigarettes mostly on base; junior enlisted personnel were the least likely pay grade to buy cigarettes off base. About one-fourth of service personnel indicated that their supervisor strongly discourages cigarette smoking (25.6 percent; CI: 24.2–26.9) or use of smokeless tobacco (26.1 percent; CI: 24.7–27.4). 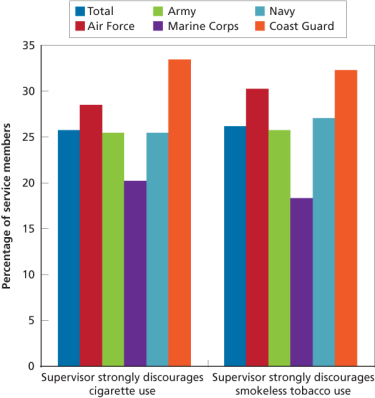 Personnel in the Coast Guard were the most likely to perceive their supervisors as strongly discouraging cigarette smoking, and those in the Marine Corps were the least likely to perceive their supervisors as strongly discouraging smokeless tobacco use (Figure 4). Officers and women were also more likely to report that their supervisor strongly discourages tobacco use. Use of either marijuana or synthetic cannabis in the past year was reported by 0.6 percent (CI: 0.3–1.0) of personnel; any other illicit drugs were used by 0.3 percent (CI: 0.1–0.4) of personnel in the past year. Smaller percentages reported using illicit drugs in the past 30 days. 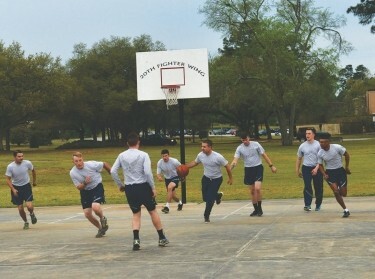 Reported illicit drug use in the past year was reported by less than 1 percent across all service branches and among both enlisted personnel and officers. 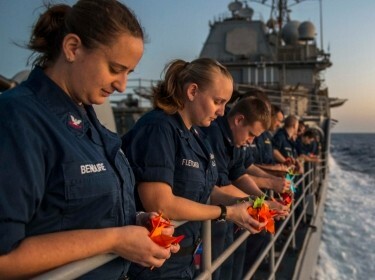 About one in seven (14.3 percent; CI: 13.2–15.4) service members reported past-month use of at least one of the five types of prescription drugs examined in the survey. Pain relievers (opioids) were the prescription drug type used most commonly in the past year and ever. However, from 2011 to 2015, the percentage of service members using pain relievers in the past month decreased by nearly half. This was true for sedatives as well. 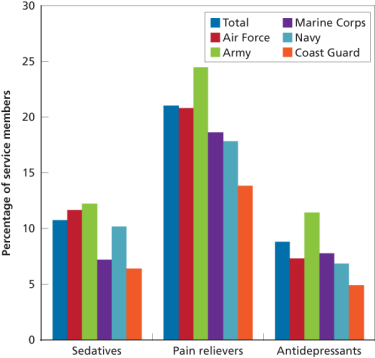 Sedatives, pain relievers (opioids), and antidepressants were more likely to be used by women than by men and by personnel in the Army than in any of the other services (Figure 5). Among active-duty service members, 4.1 percent (CI: 3.5–4.8) misused one or more prescription drug types in the past year, and 0.9 percent (CI: 0.6–1.2) overused them. In the U.S. general population in 2014, 5.6 percent of adults reported nonmedical use (i.e., overuse, misuse, or use "to get high or feel good") of prescription drugs. While the HRBS and general population measures are not directly comparable because of differences in measurement, they suggest that overall rates of misuse and overuse in the military are in line with those in the United States overall. Service members were most likely to report misuse (2.4 percent; CI: 1.8–2.9) or overuse (0.7 percent; CI: 0.4–1.1) of pain relievers versus other types of prescription drugs. Because the denominator for calculating misuse and overuse of specific drugs in the 2011 HRBS was different from that used in 2015, we cannot directly compare the percentages. However, the relative percentages misusing each drug type in 2011 can be compared and were similar to those observed in 2015: In both years, pain relievers and sedatives were more commonly misused and overused relative to steroids and stimulants. Prescription drug misuse was highest in the Army and lowest in the Coast Guard. By pay grade, prescription drug misuse was highest among senior enlisted personnel. There were no observable differences in overuse by service or by pay grade. There were no statistically significant differences between men and women in prescription drug misuse or overuse. Most service members obtained prescription drugs at a military treatment facility (MTF). 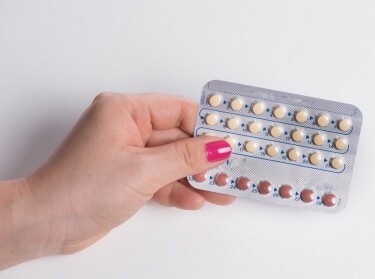 Prescription antidepressants were more likely to come from an MTF than from any other source. Anabolic steroids were the prescription drug type most likely to come from a nonmilitary source. Rates of binge drinking in the services in 2015 remained nearly as high as they were in 2011 and high enough to continue causing concern. Percentages of service members who reported hazardous or disordered drinking were also substantial. Consistent with this, one in 12 service members reported experiencing one or more serious consequences from drinking in the past year. 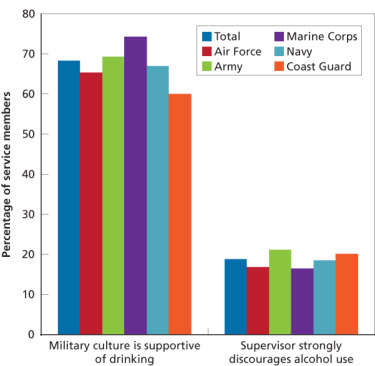 About two-thirds of HRBS respondents also perceived military culture as supportive of drinking, while fewer than one in five indicated that their supervisor strongly discourages alcohol use. This suggests that a change in culture clearly communicated from higher ranks could substantially reduce drinking and its consequences. 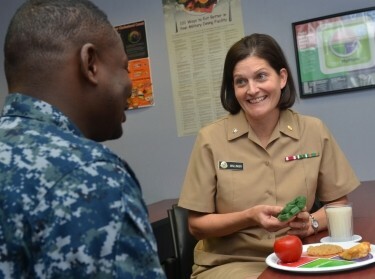 Given that alcohol is often purchased on base, raising prices or otherwise limiting sales may also be effective and help communicate a shift in culture. Cigarette smoking in the military has decreased substantially over the past decade, and those who smoke are smoking less. The HRBS found that cigarette smoking is less common in the military than in the general population. Still, any smoking puts the immediate and long-term health of service members at risk. Furthermore, smokeless tobacco use is relatively high in the military, and e-cigarette use is a growing problem. One policy lever that appears promising for addressing tobacco use is a shift in perceived military culture. Few service personnel felt that cigarette and smokeless tobacco use were strongly discouraged by their supervisor. In addition, most service members bought cigarettes on base. This suggests that changes to reduce on-base sales of cigarettes, or to increase their price, could help reduce tobacco use. Rates of illicit drug use among service members have decreased in recent years and were at low levels in the 2015 HRBS. Use of prescription opioid pain relievers and use of sedatives have both decreased as well. Nonetheless, both of these prescription drug types were misused more often than other drugs studied, and pain relievers were substantially more likely to be overused than any other drug type. HRBS response rates were lower in 2015 than in prior iterations of the survey. Low response rates do not automatically mean that the results are biased, but they do increase the likelihood that service members who responded differ qualitatively from those who did not. Those differences, then, could bias our estimates of health and health-related behavior; however, it is impossible to know whether the potential bias would result in better or worse outcomes than those observed in the data. Thus, the results of this survey should be interpreted cautiously and in conjunction with other existing data. In addition, comparing the HRBS with other civilian populations (e.g., all U.S. adults) may be difficult to interpret because of both observed (e.g., demographic) and unobserved differences between the two populations. Finally, because we altered the wording of some questions in the 2015 HRBS, the results presented in this brief may not always be comparable to prior versions of the HRBS. When calculating response rates, we excluded service members whom we were unable to contact because of incorrect email or mailing addresses. The number we were unable to contact was 6,770, or 3.4 percent of the sample. CIs provide a range in which we expect the true population value to fall. They account for sampling variability when calculating point estimates but do not account for problems with question wording, response bias, or other methodological issues that, if present in the HRBS, might bias point estimates. 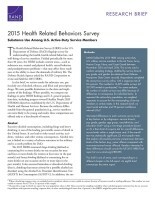 Meadows, Sarah O., Charles C. Engel, Rebecca L. Collins, Robin L. Beckman, Matthew Cefalu, Jennifer Hawes-Dawson, Molly Doyle, Amii M. Kress, Lisa Sontag-Padilla, Rajeev Ramchand, and Kayla M. Williams, 2015 Health Related Behaviors Survey: Substance Use Among U.S. Active-Duty Service Members. 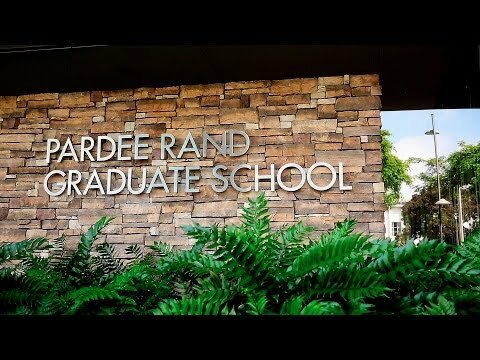 Santa Monica, CA: RAND Corporation, 2018. https://www.rand.org/pubs/research_briefs/RB9955z7.html.